A number of articles have recently been written about what a tough job you have and that if you fail, the result could be nuclear war. We at 38 North, some of whom have worked on policy towards North Korea both inside and outside the US government over the past 25 years, want to wish you good luck. Dealing with the North Koreans will be hard enough but working inside the Trump administration, with Congress and the community of Korea experts in the US will be just as if not more challenging. We don’t want to wade into the challenges of working for the Trump administration that manifest themselves every day on a variety of domestic and foreign policy challenges. All we can say is, like what Morton Halperin (who more than qualifies as someone with extensive national security experience) expressed in a recent article on our site, having President Trump in your corner in this lone case will be an enormous advantage, not an enormous downside. True, he is quirky, impatient and often impetuous—and the North Koreans will seek to use that to their advantage—but it is the difference between night and day when you are working on a tough challenge like North Korea. 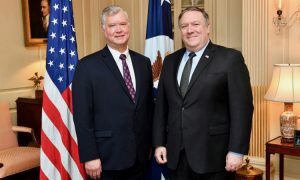 Ambassador Stephen Bosworth, the Obama administration’s Special Envoy for North Korea Policy and one of America’s foremost diplomats of the post-Cold War era, to his lasting regret, never got the chance to make his case to the President for what he thought would be an effective policy towards Pyongyang. It doesn’t sound like you will have that problem and that is extremely important. Second, another huge advantage you will have over your predecessors is that, contrary to those who still believe that the North may be engaged in a “charm offensive,” Kim Jong Un has made a “strategic decision” to move from building weapons of mass destruction to focusing on economic development. It has been evident in everything he has said and done since the beginning of this year and the decision may even date back to before the Trump administration took office. That’s the holy grail sought by successive US administrations over the past 15 years. True, Kim probably wants his cake and to eat it too—to keep at least some of his nuclear weapons while developing his economy. But it’s your job to use the enormous positive leverage the US has to ensure that doesn’t happen. Third, another positive reality is that past administrations would have given their eyeteeth to be able to communicate directly with the North Korean leader as both President Trump and Secretary Pompeo have done, both to discern his intentions and to see if there were peaceful paths ahead. This is, after all, North Korea: what the leader says goes. Those opportunities have been rare in the past. Jimmy Carter meeting with Kim Il Sung in 1994, regardless of popular myths, was helpful in avoiding the second Korean War at the height of the first North Korean nuclear crisis. Secretary of State Madeleine Albright’s meeting with Kim Jong Il in 2000 was also another important opportunity for direct communication. Bill Clinton’s meeting with Kim Jong Il in 2009 was much more circumscribed because of the circumstances. He went to retrieve two American journalists detained by the North. Nevertheless, he concluded from his meeting that there might be an opportunity to move forward on the diplomatic front. That was the last time the US was able to reach directly to the center of the North Korean state. Fourth, having a South Korean partner committed to exploring the possibilities of peace on the Korean Peninsula—something that hasn’t existed for a decade—is a godsend, not a burden. That’s become very obvious with each successive meeting between President Moon and Kim as the South Korean leader has skillfully played the role of mediator. What is shocking to me is that in the almost 25 years I have been working on this problem, the North Koreans have never agreed to discuss nuclear and missile issues with the South, to the frustration of past Korean presidents who wanted to single-handedly solve this problem. But now, Kim is not only discussing these issues with President Moon, but he is also starting to unveil his negotiating position towards the United States. That’s how we should read the last North-South summit. Kim’s initiative that the North would dismantle the Yongbyon nuclear facility—where it produces plutonium, some enriched uranium and probably tritium that can be used to build hydrogen bombs—is probably only the tip of the iceberg of what the North might be willing to do in the first phase of a denuclearization agreement. Of course, your job is to explore the bottom line—what else might the North be willing to give up at the beginning of this process. Fifth, your starting out as an experienced foreign policy hand with no background in dealing with North Korea is a disadvantage but one that can be overcome, provided you get the right advice and have your own stable of real experts. My former boss, Robert Gallucci, appointed in 1993 as the chief US negotiator, used to tell the North Koreans during meetings that he wasn’t an expert on their country, prompting some of his staff to wince. But he quickly brought himself up to speed with the help of experts and was also able to effectively bring to bear his other experiences—dealing with Iraq’s WMD programs and a collapsing Soviet Union, as well as a keen sense of US national interests—in negotiating with the North. Presumably, you will be able to do the same. And by the way, if there is one piece of advice I can offer in this context, ignore the historical myths that are so prevalent about US-North Korean relations. One that appears over and over again is that the North Koreans have fooled the US in every negotiation over the past 25 years. It is true the record is mixed and it is also true that the end result, where we are today, is certainly not a sign of success. But it is possible to have a successful negotiation with the North. US intelligence estimates in 1994 were predicting Pyongyang could have almost 100 nuclear weapons in a decade. But the 1994 denuclearization deal, which wasn’t just a freeze, stopped that from happening. By the time it collapsed in 2002, the North barely had enough material for five weapons and its production facilities were in complete disrepair. Look to that experience, when it was crystal clear that the North wanted to build better political, economic and security relations with the United States and was willing to sacrifice a vibrant nuclear weapons program to achieve that objective. There are some experts out there who would quickly say, that’s not true. The North Koreans were cheating and pursuing a separate path to building the bomb—highly enriched uranium. That is true, and I would note we caught them early in that effort but were prevented from doing anything because of concerns over revealing intelligence sources and methods. But a more important point is that under the 1994 agreement, the North Koreans gutted a well-advanced plutonium production program to such an extent that even with an active uranium enrichment program, they still have not achieved the stockpile levels they were expected to reach in the early 2000s. Yes, this is a tough job for a variety of reasons. But Mr. Ambassador, you have enormous advantages that many if not all of your predecessors—all capable, even extraordinary diplomats—didn’t have. You have an opportunity, working with South Korea, North Korea and other countries, to finally end six decades of confrontation on the Korean Peninsula. We at 38 North wish you good luck.